Small Mamluk Purse Workshop – The Embroiderers' Guild, Queensland Inc. While in the UK, Alison visited the Ashmolean Museum in Oxford and was delighted to see the wonderful Mamluk textiles from Medieval Egypt. Many of you have stitched her Medieval Egyptian Sampler and this little purse is part of the same collection of textiles. 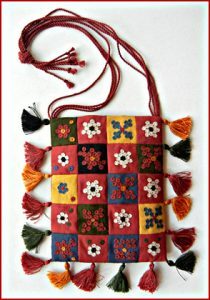 The pieced size of the purse is approximately 12 cm x 16 cm. This project is suitable for all levels of embroiderer. Students will have the option of purchasing a small fabric kit from Alison, using the colours which are close to those of the original purse, or selecting their own fabrics. There is no pre-class preparation. Alison has also worked a back for this little bag. It is available in a separate kit at the class as an optional extra for students who attend the workshop. If students require fabric for the back of the purse, fabric is available at an additional cost of $30.